As is customary in these parts around this time of the year, when the weather is hottest, our minds turn to the coolest sport we know - college football. With all apologies to our brethren on the hardwood and the ice, and to our friends who worship the battles on Sunday afternoon (the NFL will be previewed in next month’s publication), college football is what makes the wheel go ‘round – around here. And with sincerest apologies to the fans of UCF, USF, FIU and FAU the focus here will be on the state’s big 3. While other schools will have their moments of interest and glory (in FAU’s case, lots of drama with new coach Lane Kiffen; at USF perhaps an undefeated season? ), no other state can boast three consistent top 20 teams, not even Texas or California. So, let’s begin, in order of predicted highest finish (and as the old gaming machines use to say, this is for amusement purposes only). FSU: If you’re Head Coach Jimbo Fisher, life is hard to beat. You just completed another successful season, and even though you missed the collegiate playoff, you finished the year with a thrilling win over highly regarded Michigan, then capped it off with a top 5 recruiting class. Sure, you lost a lot of talent to the NFL, including all-world running back Dalvin Cook, but you just reload at this point. Your quarterback, Deondre Francois, is a dark horse Heisman favorite, your skill positions are solid and your defensive backfield features 3 pre-season all conference guys. Plus you play in the ACC, meaning that while Clemson will be a tough road matchup, you get Louisville and Miami at home. And the opening weekend salvo against Alabama? It might not even be remembered come December. Prediction: 10-2. 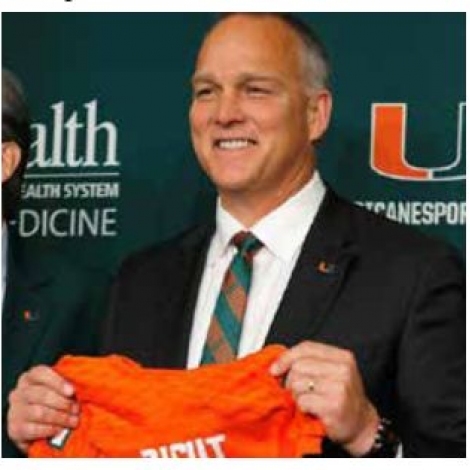 MIAMI: If great expectations are a curse, then UM Coach Mark Richt may want to spend some extra time looking for a gypsy to break curses, ´cuz the Canes are everybody’s darling. To the point where almost everybody expects them to be playing for the conference title in December (probably in a rematch vs. FSU). In his 2 nd year, Coach Richt has reignited the fan base with terrific recruiting, a veteran defense lead by coach Manny Diaz, who likes to run an in-your-face style, and a ton of offensive talent lead by Pre-Season All Conference RB Mark Walton. Quarterback play will be an issue, with no clear starter emerging to date, but keep an eye on talented freshman N’Kosi Perry to be the breakout guy. Prediction: 11-1. Florida: Stop me if you’ve heard this before: great defense, though they lost a boatload of starters to the pros, very good skilled position players, an improving offensive line, but lots of questions at quarterback. Familiar? It should be. It could be the preview for the last two campaigns under Jim McElwain. Yes, troubled WR Antonio Callaway, suspended along with 6 other players for the opener versus Michigan, should be a difference maker, as should a solid RB corps lead by underrated Jordan Scarlett. Defensively, losing senior safety Marcell Harris hurt, but there’s NFL potential all over this defense, and new coordinator Randy Shannon will be anxious to run the controls. The problem? Quarterback play, where it appears lackluster junior Luke Del Rio has positioned himself to win the job – again – despite the appearance of sophomore Felipe Franks and senior transfer Malik Zaire. So Gator fans, until the offense shows it can be better than putrid, the football gods will not be kind. Prediction: 7-5. That’s it. Good luck to your favorite squad and let’s kick it off!